Organizers of the much-anticipated boxing event dubbed, ‘Legendary Night Boxing’; Fresh King Entertainment (FKE )and Box Office Sports (BOS) Promotions has indicated that due to circumstances beyond their control, the event has been postponed to a later date. The boxing event was scheduled to come off on April 29, 2016 at the Accra Sports Stadium – 7pm, would have been a live broadcast on SuperSports on DSTV and GOTV respectively. In a press release received by amalarbieafrica.com; it states that the two promotional outfits, FKE and BOS are working on a new date and further details regarding the event will be announced in due course. 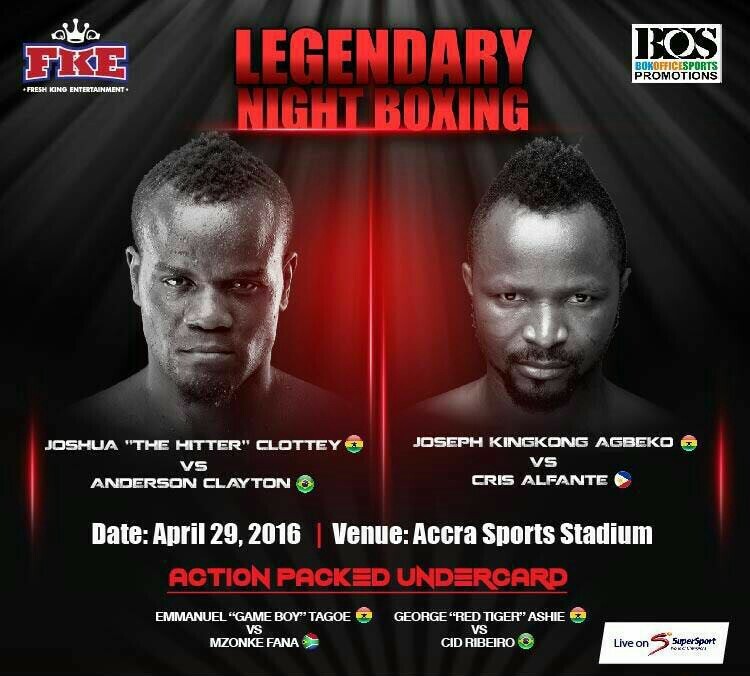 However, "Ghanaian boxing lovers should be assured that the promoters as well as the two former world champions, Joseph Agbeko and Joshua Clottey are committed in delivering a historic boxing event as the two (King Kong and The Hitter) are prepared and will be ready to showcase their best boxing artistry to their Ghanaian fans once a new date has been decided on," the statement noted. The organizers would like to apologize for any disappointment and inconveniences th postponement of the event might have caused.